A young boy told his mother that his father had taken him to the zoo. The mother couldn’t believe it. Carl is the horse with attitude! 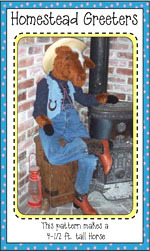 4.5 ft. tall horse pattern with vest pattern included. People absolutely love the 4.5 ft. tall Homestead Greeters! Save 67% with our 6-in-1 Large Animal Combo! Save 67% off on large stuffed animals patterns with our 6-in-1 combo package. 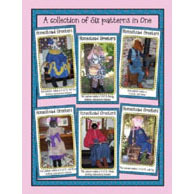 You get 6 of the most popular 54″ tall Homestead Greeters™ stuffed animal designs on 4 huge poster-size pages for only $20(a $60 value). Free shipping included to USA and Canada. Plush pig, horse, mouse, cow, sheep, and bunny included.